Walker and Akley, both seniors double majoring in biochemistry and fermentation chemistry, have been co-presidents since From the Ground Up was formed in April 2018. Robert Dixon, PhD, associate professor in the Department of Chemistry, is the group’s faculty advisor. The student group addresses current concerns about food and the environment such as GMO’s or genetically modified organism and roundup ready corn, noted Akley. 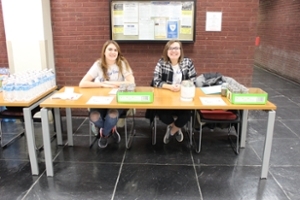 Accepting donations for homemade pickles are From the Ground Up Co-Presidents Catherine “Cat” Akley (right) and Shea Walker. 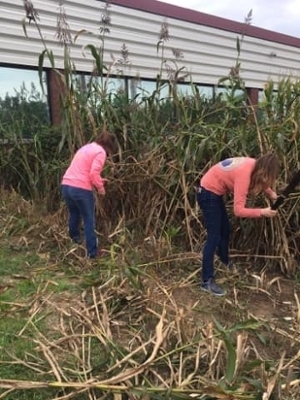 Akley and Walker work harvesting sweet sorghum.